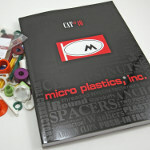 Micro Plastics introduces its new 300-page catalog #40 containing thousands of fastening solutions for engineers and product designers. Find hundreds of new problem-solving products, including Spacers, Washers, Clips, Clamps, Ties, Bushings, Screws, Nuts, Rivets, and Plugs. Micro Plastics specializes in Nylon threaded fasteners, but the company also offers extensive product lines for wire management and circuit board hardware. FREE samples are available upon request. In an effort to better monitor the structural health of military equipment, Picatinny Arsenal and engineers from the Naval Air Warfare Center Aircraft Division (NAWCAD) Lakehurst have recently teamed up to embed 3D-printed metal parts with internal sensors. Because the external sensors for structural health monitoring currently operate outside the component, they do not always provide an accurate representation of internal damage. Yale University engineer Adam Spiers has created a handheld, shape-shifting cube that twists to direct users toward their next destination and extends forward to indicate the distance to reach it. Columbia University scientists have developed two novel devices that derive power directly from evaporation: a floating, piston-driven engine that generates electricity causing a light to flash, and a rotary engine that drives a miniature car. By integrating the latest technology and leveraging the power of the LabVIEW RIO architecture, FireFly Equipment developed a "smart" ProSlab 155 turf harvester that increases harvesting speed 20 percent and reduces diesel fuel consumption 50 percent. 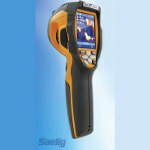 The THT45 Thermal Imager available from Saelig is a professional compact infrared and visible 80- x 80-pixel camera equipped with a very bright 2.8-in. display and a frequency response of 50 Hz, intended for infrared non-contact temp measurement from -20 deg C to 350 deg C. It features a perfectly aligned video camera that allows picture-in-picture fusion of visible and infrared images. The camera has a 32x electronic zoom, and still or video images can be stored via the microSD slot or a USB 2.0 connector. The THT45 contains a built-in laser pointer for accurately locating temperature faults, as well as LED illumination for improved visible images. 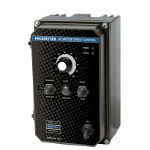 This unit is ideal for detecting thermal issues due to problems in electrical systems, mechanical and hydraulic systems, air conditioning, automobile servicing, etc. Under 1,000 bucks. Magnesium is the lightest usable structural metal, widely available and easy to produce, so no wonder it is steadily replacing iron, other metals, and even plastic in an increasing number of applications. It's nearly as strong as aluminum and about one-third lighter, giving it a significant strength-to-weight advantage. Gus Breiland, Customer Service Engineering Manager from Proto Labs, runs through the fabrication methods for magnesium, design and prototyping considerations, corrosion and safety issues, and the basics of thixoforming -- a high-speed injection-molding process that is gaining in popularity. For over 50 years, engineers have relied on Smalley’s Engineering and Parts catalog as an essential resource for their designs. As The Engineer’s Choice for Wave Springs, Spirolox Retaining Rings, and Constant Section Rings, the newly released catalog offers engineers a glimpse into how Smalley’s engineers partner with you to deliver solutions that meet or exceed target application performance. 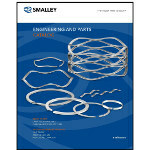 The latest release features: an updated introduction to Smalley’s expanded product range, engineering expertise, and industry experience in custom designs; an introduction to the Bearing Preload series explaining the benefits of using Smalley wave springs to prolong bearing life; and Linear Springs, Smalley’s latest innovative product, as a standard series. Request or download your copy today. 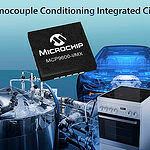 The MCP9600 from Microchip Technology simplifies thermocouple designs by integrating a number of discrete devices into one chip, which also lowers board area, cost, and power consumption. This unit provides the world’s first plug-and-play solution for creating thermocouple-based designs, because it eliminates the design expertise required for a discrete implementation, such as firmware development using an MCU’s math engine. Designers no longer have to create precision instrumentation circuitry to accurately measure a thermocouple’s microvolt-level signals, nor do they have to design ADC circuitry for precise temperature calculations. With the MCP9600’s integrated cold-junction compensation, calculating the “hot” junction temperature of a thermocouple doesn’t necessitate thermal design expertise to precisely measure the reference temperature of the thermocouple’s “cold” junction. 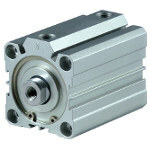 Bimba Manufacturing Company has added compact pneumatic cylinders to its full line of MFD products. The new double-acting MACQ series cylinders are constructed with a robust, extruded aluminum body and are available in 10 different bore sizes and a wide range of standard stroke length. The new cylinders can also be obtained with a magnetic piston to enhance position sensing. This compact line is suited for a broad range of general automation processes, providing flexibility in space-sensitive machine design applications. The low-cost line is also globally interchangeable with industry alternatives, allowing for quick drop-in replacement parts. Bodine Electric Company’s newest variable-speed AC motor speed control is simple to set up and operate, and it features an extremely rugged NEMA-4X/IP-65 enclosure. The model 2999 Pacesetter AC speed control is ideal for standalone AC gearmotor applications that require controlled acceleration, adjustable operating speed, or reverse operation. Typical applications include conveyor systems, packaging machines, food processing equipment, medical or lab equipment, and a wide range of other industrial automation equipment. This unit is designed to drive 230-VAC, 50-Hz or 60-Hz, inverter-duty, 3-phase gearmotors and motors that are rated up to 1 HP (746 W). Operated by the non-profit San Francisco Maritime National Park Association, the Pampanito has been restored by association volunteers to a specific point in time -- late 1945 -- to represent the height of WWII submarine development. This restoration effort includes making key submarine systems fully functional, so visitors can see the periscope being raised and lowered, and the torpedo doors being opened and closed. Imagine staying dry underwater for months. Now Northwestern University engineers have examined a wide variety of surfaces that can do just that -- and, better yet, they know why. Inspired by the limitations of biomimetic glues in wet environments, scientists from Nanyang Technological University, Singapore, have invented a glue that will harden when a voltage is applied to it. The material has other interesting and useful properties, including the ability to be "uncured." dryspin high helix lead screws and nuts from igus are specially designed to offer extremely long service life and improved mechanical efficiency. Lead screw design features optimized thread angle and asymmetric geometry, along with self-lubricating, highly wear-resistant nuts. 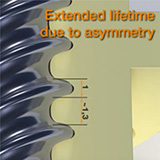 dryspin lead screw systems have proven to offer dramatically lower wear than other high helix plastic lead screw nut technologies. Learn more about dryspin in this brief video overview. BLOODHOUND SSC is a Land Speed Racing Car designed in the U.K. to inspire a generation to study science and engineering and set a World Land Speed Record of 1,000 mph in 2016. It includes a cluster of Nammo hybrid rocket engines that have a Jaguar-powered fuel pump, Parker assisted airbrakes, and a Eurojet EJ200 jet engine.